In October 2016 Fingal County Council approved PST Sport as the design and build company for the development of a full-size 13,000m artificial grass pitch at Le Chéile Secondary School in Tyrrelstown, Co Dublin. For this particular project PST Sport took on a design and build role and worked seamlessly with Principal Contractors Glasgiven Contracts Ltd. who were the main contractors for Tyrrelstown Educational Campus. 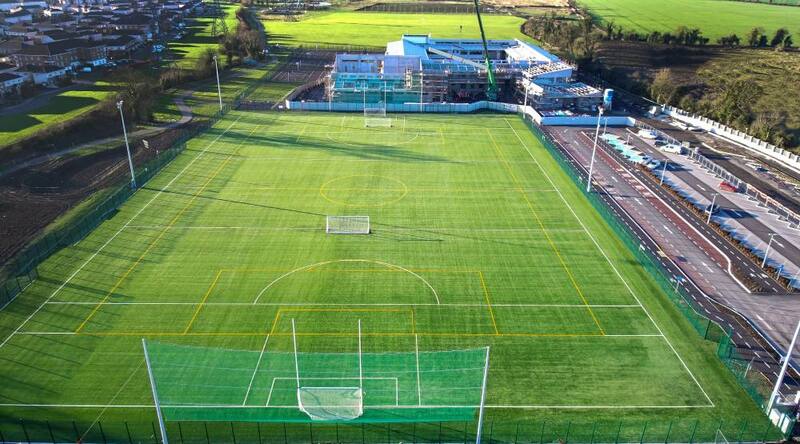 The project included 13,000m of 60mm Terra Turf artificial grass carpet, shock pad and groundworks. The sub-base make up alone involved 12,000 tonne of stone. From the outset, it was obvious that PST Sport held the in-house expertise and technical ability to successfully deliver this element of our project. The nature of the site presented some unique challenges. This included a “live” stream which traversed the pitch, overhead ESB lines that had to be diverted prior to construction and the rather poor existing ground conditions. PST Sport took a lead in the design development of the pitch and proactively engaged with all stakeholders and brought to the table cost effective and workable solutions without compromising on safety, quality or programme. Innovative measures developed by PST Sport included use of geotextiles and sub base drainage to ensure the final surface level of the pitch will be correct and maintained for the lifetime of the pitch. PST Sport completed this project safely on time, within budget and to the highest standards. They worked with Glasgiven Contracts Limited to add value to the project by ensuring the 3G pitch is certified to meet the requirements of major sporting codes. The standard of finish achieved by PST Sport on the pitch is exemplary and is a credit to the management and operatives of PST Sport who we found to be courteous, knowledgeable and driven.